Address: René Baulard, 13, Encamp, Andorra. Set by the river in the centre of Encamp, Hotel Univers offers a free shuttle service to Funicamp’s ski lifts, a 5-minute drive away. 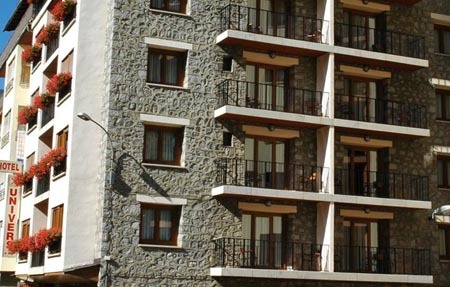 It is 4 km from Les Escaldes Shopping Centre and Andorra la Vella. Hotel Univers offers heated rooms with free Wi-Fi and satellite TV. Free ski and bicycle storage is also available. The hotel restaurant serves a range of traditional Andorran cuisine. There is also a bar. Staff at the 24-hour reception can arrange activities such as snow shoeing and hiking trips. Ski passes and tickets to Caldea Spa can also be bought here. Free parking is available on site. Please inform Hotel Univers in advance of your expected arrival time. You can use the Special Requests box when booking, or contact the property directly with the contact details provided in your confirmation.